The #1 Sales Professional for Berkshire Hathaway HomeServices Florida Realty, Charron ranks among the Top 100 agents in the state of Florida. With over 16 years of real estate experience and numerous awards within the industry, she has been recognized among the prestigious Five Star “Best in Client Satisfaction” honorees 2009 – 2018 and holds the highest priced residential sale in history for Sarasota in 2011. “It is an honor to be recognized as a top agent in Sarasota and Florida. My success is a result of hard work, dedication to my profession, and being an ambassador for our great community,” said Charron. 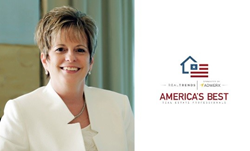 Pam Charron, Berkshire Hathaway HomeServices Florida Realty’s Top REALTOR®, has been recognized for the third time as one of “America’s Best Real Estate Agents” by REAL Trends. A CERTIFIED LUXURY HOME MARKETING SPECIALIST® and member of the Institute of Luxury Home Market Million Dollar Guild, Charron specializes in residential real estate and strategic marketing initiatives, with a heightened knowledge and expertise in luxury resale properties, waterfront, condos, golf communities, new construction, estate and relocation services. For more information about Pam Charron, visit SarasotaAndBeyond.com. “We are extremely proud of Pam and look forward to continuing to support her unparalleled commitment to quality and outstanding customer service through our company’s network, tools and resources,” said Rei L. Mesa, President and C.E.O., Berkshire Hathaway HomeServices Florida Realty. Pam has repeatedly earned the Chairman’s Circle Diamond Award, which honors the top 1/2% of sales professionals within the Berkshire Hathaway HomeServices Nationwide Network. REAL Trends is a residential real estate consulting and communication company, widely known as the trusted source for data, news, and trends for the residential real estate industry. This year’s recognition, 2018 THE THOUSAND, ranks individuals and teams by transactions and volume. REAL Trends “Best Real Estate Agents in America” uses a verified application process, ranking top agents across the U.S. for sales volume and performance. Berkshire Hathaway HomeServices Florida Realty serves 21 counties throughout Florida with over 40 locations and approximately 1,900 Sales Professionals. The full-service brokerage company, founded in 1999, is a subsidiary of Lennar Corporation, a Fortune 500 company and is a franchise member of the Berkshire Hathaway HomeServices’ network, one of the few organizations entrusted to use the world-renowned Berkshire Hathaway name. The company offers residential and commercial services as well as seasonal rentals, property management, REO & Foreclosures, corporate relocations, referral services, mortgage, title, home service plans, and personal concierge services. Berkshire Hathaway HomeServices Florida Realty ranks in the Top 10 in the network among 45,000 Sales Professionals, 1,350 offices throughout 47 states. The company is the overall No. 1 fundraiser for The Sunshine Kids Foundation, having generated more than $3.5 million since 2001.